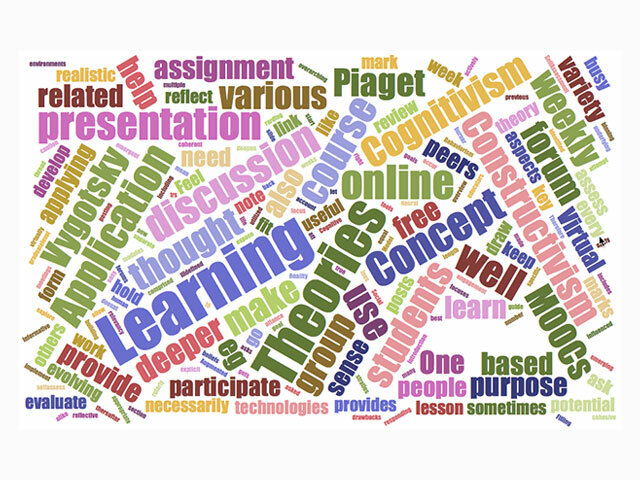 ETEC 512 provides an overview of traditional theories of learning (e.g., Behaviorism, Cognitivism, Neural theories of learning, as well as Cognitive and Social Constructivism), and focusses on their relevance for online learning contexts. In addition, this course provides an introduction to emergent and evolving perspectives and approaches to online learning (e.g., Gamification, Virtual and Augmented Reality, and MOOCs). As will become clear during ETEC512, there is no ‘best’ theory that can account for all aspects of human learning. As such, the overarching objective of this course is to expose you to a variety of theories, each of which has potential to be useful in understanding learning and teaching in a variety of settings. However, for this information to be useful, educators need to have an understanding of when and how different approaches should be utilized. To this end, many of the assignments and activities of this course will focus on applying different theoretical perspectives to ill-defined, realistic learning situations. In addition, one of the goals of this course is for you to develop a coherent, explicit sense of your own beliefs about learning, and how the various theories hold together and are related to, or influenced by, the other perspectives. Critically evaluate and identify the underlying learning theories for various instructional practices and approaches. Use learning theories to reflect on and effectively guide your pedagogical decisions and instructional practices. Assess and implement appropriate technologies for specific contexts based on identified learning theories. Articulate your evolving theoretically-based understanding about how people learn in different learning contexts. Critically evaluate and effectively apply instructional strategies based on emerging trends in online environments. This course comprises four separate modules, not of equal length. In addition to graduate-level course readings, you will participate in a variety of activities and discussions that are designed to encourage deeper engagement with the course material. Note that there is no ‘best’ or ‘right” theory that can account for all aspects of human learning. Therefore, the overarching goal of this course is to expose you to a variety of theories, each of which has potential to be useful in understanding learning and teaching in a variety of settings. All the required readings are available online via the Library Online Course Reserves (LOCR) linked to the course navigation menu. Bush, G. (2006). Learning about learning: From theories to trends. Teacher Librarian, 34(2), 14-18. Gee, J. P. (2005). Learning by Design: Good Video Games as Learning Machines. E-Learning and Digital Media, 2(1), 5-16. Schunk, D. H. (2012). Chapter 2. Neuroscience of Learning. In Learning Theories: An Educational Perspective (6th ed.). Upper Saddle River, NJ: Pearson. The EDUCAUSE Learning Initiative (ELI). (2017). Augmented Reality, Virtual Reality, and Mixed Reality. You will complete three short Though Papers during the course, in response to questions designed to provoke deeper understanding about the readings and course materials. They should be viewed as an opportunity to delve further into an issue or question. This assignment will be completed in groups of 2-4. You will work together to expand on the theories presented in this course, as well as link them to online learning contexts. This will will involve developing an interactive and engaging online presentation that will be presented during the Virtual Conference on Learning, which occurs during weeks 11 and 12. Each group will create an online presentation about one of the theoretical perspectives presented in the course. A concept map is a visual organization and representation of knowledge. We are hoping that by providing several different modes and opportunities (e.g., visual, written, in dialogue) to consolidate the content of this course, you will come away with a deeper, more articulate sense about how it is that you think people learn. For the purposes of this assignment, we would like you to make a concept map that represents how you think the various theories are related to each other. This assignment will ask you to describe a learning scenario (can be a lesson you have taught online or face to face, or a lesson you have received, or any other educational experience) and then to analyze it, using the theories that have been presented in this course.